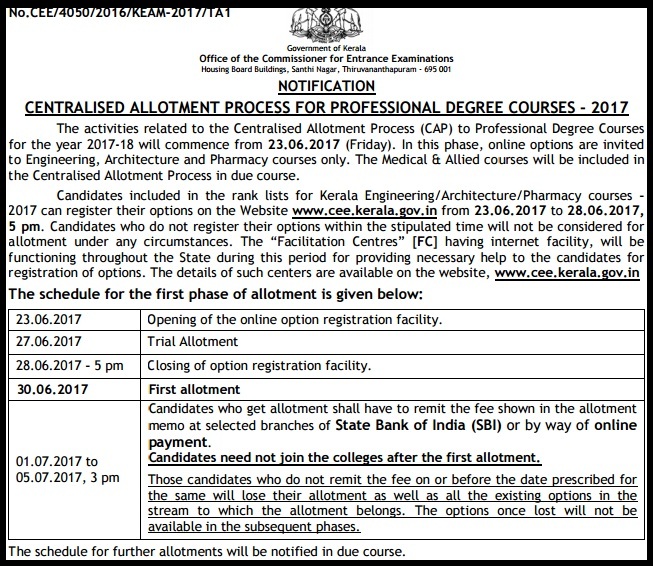 KEAM Seat Allotment 2017 Medical Engineering (केईएएम सीट आवंटन ): The Commissioner of Entrance Exam, Kerala conducted KEAM 2017 in April 2017. The students who have qualified the entrance exam and shortlisted for the KEAM Counselling 2017, they will be able to register themselves for KEAM 2017 Allotment on 23rd June at 9:00 P.M. The authorities will release the KEAM Allotment Registration 2017 link on their website. We will provide a link through which you will be able to register yourself for the allotment process. The students who are eligible for the CEE Kerala KEAM First Allotment 2017 and waiting for the counselling registration link. They can now register for the allotment process. The authorities will organise KEAM Trial Allotment on 27th June 2017. The registration for the first allotment will close on 28th June. The counselling organising committee will conduct the counselling in the form of KEAM CAP Allotment 2017. The aspirants will be selected on the basis of their marks in the entrance exam. The admissions will be provided according to the rank of the student. The students are required to follow the below-described procedure for the confirmation of the allotment of the seat. The CEE Kerala 1st Allotment 2017 will start on 30th June. The students have to fill the counselling form properly. They have to select their preferences for the college and course in the registration process. 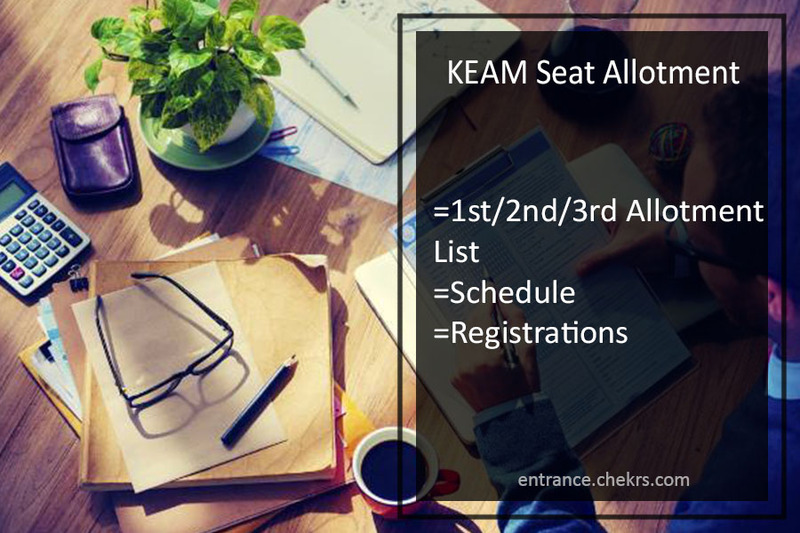 Steps to follow to join the KEAM First Allotment 2017.
then they have to click on the “KEAM Candidate Portal”. Now select the registration link from the notification panel. Enter your all details like roll number, name etc. A unique id and password will be provided to the candidates. The students have to select their preference for the college and course. Once the choices are locked they cannot be changed. The aspirants have to pay the counselling fee for the allotment via any of the online banking modes. Now take a print out of the generated registration form. Carry that form on the day of counselling. The students will be able to join the trial allotment before first and KEAM Second Allotment 2017. The student can choose their preferences for the college and courses. It will help them to know the procedure of the counselling and the KEAM CAP Allotment. The students must note that the confirmation of seat in the trial allotment doesn’t give you the surety for the course or college. The Commissioner of Entrance Exam Kerala will release the KEAM 1st Allotment List 2017 after the end of the round. The students who will be allotted seats have to report at the allotted centre and have to pay the required admission fee. The dates for the KEAM 2nd Allotment List are not announced yet. The students are advised to stay in touch with our site for the latest updates. For feedback and more queries regarding KEAM 3rd Allotment List 2017, you can contact us by commenting in the comments section given below.